This is the moment that many people have been waiting for. Starting today, any seller who wants their items to be among the first to be displayed in the Vault and brought to the 34th National Sports Collectors Convention in Rosemont, Illinois may now make their items Vault-eligible. 1) Find your item, either in your Inventory Manager or by typing the item number into COMC’s search bar. 2) In the ‘Actions’ dropdown menu, select ‘Make Vault Eligible’. 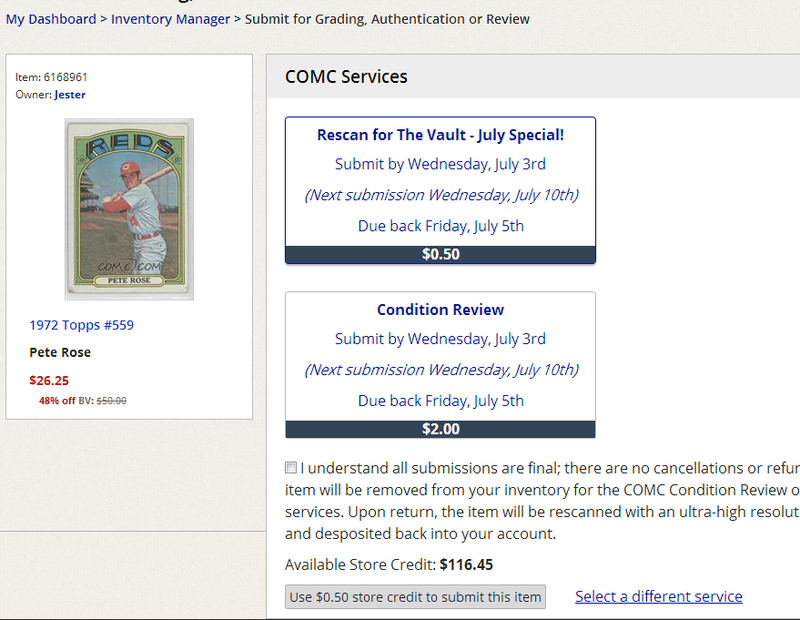 3) Graded items and COMC Reviewed items are both Vault-eligible already. In addition we have added a new service under COMC Services which allows you to rescan an item with our new 36x zoom technology for only $0.50 which will also qualify an item to be Vault-eligible. The $0.50 price is a limited time special available through the end of July to help celebrate our launch, so take advantage of it before it’s too late! It’s that easy. Shortly we’ll add a feature which will show users if their cards are already Vault-eligible (if an item currently Vault-eligible is submitted to this service the $0.50 charge will be refunded). If a card is Vault-eligible you’ll soon have access to all the great Vault features. Please note: Items listed on The Vault must have both an asking price of at least $40 and a high Beckett Book Value of at least $20 (unless they are not assigned a BV due to scarcity – “N/A” cards). We’re very excited to roll out this service, as customers have been requesting it for a long time. Vault eligible items will be able to be listed for sale on The Vault in mid-July, and any item listed for sale on The Vault by Wednesday, July 24th will travel with us to Illinois to be showcased at the nation’s biggest card show. We look forward to displaying your cards at this prestigious show and hearing your thoughts about the Vault Service. Be sure to take advantage of this limited time offer to have your items made Vault-eligible, and be sure to keep following us on our Facebook, Twitter, and new Google+ pages. This entry was posted in How To, Service Update, specials, The Vault. Bookmark the permalink. Is the fee a penny a day per $1000 regardless of the number of cards? Hi, Jason. Right now the plan is $0.01 per card per day per $1000 of asking price (or $3.65 per year). At that price COMC is still actually subsidizing the cost to insure a $1000 item. If someone wanted to list a bunch of cards between, say, $50 and $150, I could definitely see us developing some sort of volume plan like we have with the account upgrade available on COMC.com. Please let me know the volume plan because at the current rate it is not cost effective. I can very easily have $30-50,000 in value on the site. Plus, I have my own dealer insurance and it’s covered at a place of consignment as well. Would I have to pay the insurance on your end as well? Nice job guys. Thanks for all your hard work to make this happen. is it possible to withdraw cards submitted to the vault after the trial period is over? i’m not sure if i have anything that is really worth the .01/day, but i might be willing to give the service a try until september to see if it is worth the price. Good question. 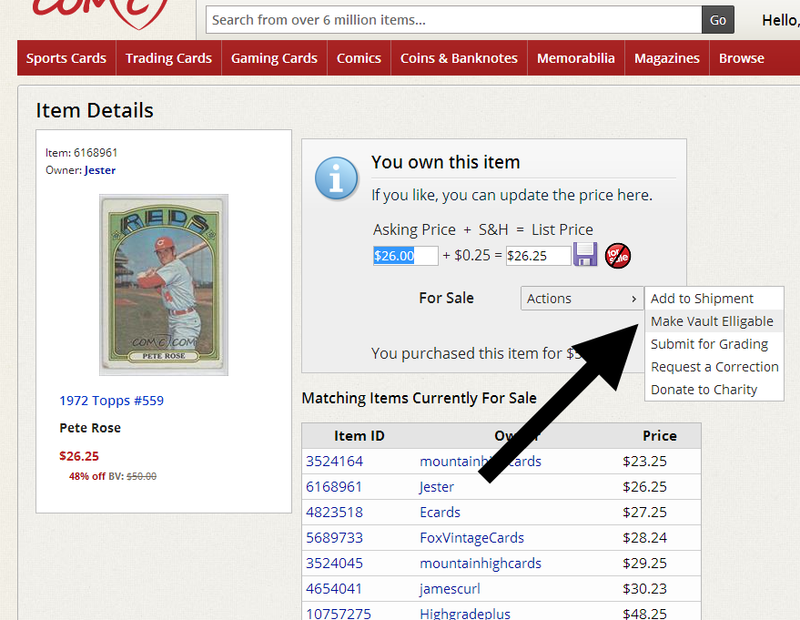 You may list any Vault Eligible item on The Vault or mark as Not for Sale at any point, just as you can today on COMC. I’d encourage you to give it a try. Just as a reminder, all items listed for sale on The Vault by July 24 will be taken to the National where they can be viewed and purchased by those at the show as well as those using vault.comc.com. Please let our Customer Service team know if you have any other questions about The Vault service. I don’t want to use this service but it appears a card I bought in a port is supposedly in the vault, how do I get it out? Hi! While your card may be “Vault-Eligible”, it won’t be listed on the Vault until you decide to put it in the Vault. So, you don’t really have to do anything. Sorry for any confusion. Thanks! You can indeed! If you have these cards processed at the One Day Service level, any cards valued at over $20 and with an asking price of $40+ will be eligible. what do I need to do to my Graded cards (to make it vault eligible) ?